Rapid technological developments & economies of scale in process plant industries has led to severe operating temperature and pressure conditions for reactors, pressure vessels, and heat exchangers. In the same way, all upcoming plants and equipment for nuclear, defense and aerospace industries are also getting bigger and more complex. To cope up with this trend, new generation materials are being developed worldwide, design aspects are becoming increasingly complex with very stringent quality and safety requirements. In addition, the delivery time is being squeezed to minimize the project cost. All these developments continuously pose new challenges to the welding technologists connected with heavy engineering industries worldwide. Till the advent of the new century, Indian heavy engineering industries were mainly engaged in catering to the needs of domestic customers for equipment and accessories. In fact, many of the Indian customers were insisting Indian heavy engineering companies have a tie-up with international companies as a pre-request for qualification as a bidder. Similarly, international customers were not comfortable with Indian suppliers as far as supply of critical equipment was concerned. Some of the Indian heavy engineering industries took this up as a challenge to demonstrate that they were as good if not better then foreign fabricators. There is continuous development of materials for all the industries to improve process efficiency, reduce the weight of equipment, improve plant life and reduce plant maintenance/ shut down. Designers are coming up with a newer variety of materials thereby posing challenges in front of manufacturing industry to come up with suitable technology for processing the same. Creep Resistant Cr-Mo Materials- Conventionally, creep resistant 2.25 Cr-1Mo material is very widely used in Refinery & Fertilizer applications up to 4500 C. Increase in temperature and pressure conditions and also susceptibility to hydrogen attack in such environment called for improved materials. Thus in the late 90's steelmakers came out with never variety of 2.25 Cr-1Mo material, known as vanadium modified 2.25 Cr-1Mo material. Use of these high strength materials helps in substantial reduction in vessel weight due to thickness reduction. Typically, changing the material from conventional 2.25 Cr-1Mo steel to 2.25 Cr-1Mo-0.25V steel will result in nearly 30% reduction in weight in a typical 1000MT reactor. This is a huge saving and as a result, all designers are changing over this new generation material to take advantage of this benefit. 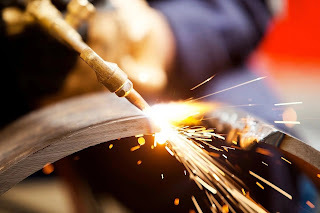 Welding is one of the important operations in fabrications. Recent developments in design and operation have put a lot of challenges in front of welding engineers which has led to many innovations such as the introduction of new processes/ variants of processes, new techniques, mechanization and several others. Narrow Gap Saw: Most of the reactors and vessels manufactured nowadays are heavy wall thickness (>100mm). While welding of high thickness welds in such equipment, adoption of Narrow Gap SAW technique provides great advantages in terms of reduction in welding consumables and cycle time. In NG SAW, the sidewalls are nearly vertical (with 0.50 angle) and the top opening of the groove is as low as only 28~30mm irrespective of thickness. It is very important to get the welding operation 'first time right' since it is extremely difficult to carry out post weld repairs. Use of contractor non-contact type seam tracking devices and turning rollers with drift control is mandatory for successful welding of such joint. This technique has been successfully applied in welding high thickness Carbon, Cr-Mo and Stainless Steels. Narrow Gap Tandem SAWis one of the process variations of SAW, wherein two (or more) wires are fed from separate welding heads and power sources into the same weld puddle. Use of two wire Tandem SAW increases the productivity by about 90% and is regularly used by fabricators. Capability to weld up to 800 mm thick joints have been demonstrated by Indian fabricators. Weld Overlay by ESW/SAW: for equipment operating with fluid which is corrosive, normally, inside surface of C-Mn or low alloy steel is cladded/ weld overlaid with corrosion resistant material. A typical reactor requires nearly 25MT of weld overlay (assuming 4.5mm thick weld overlay) to cover the entire inside surface of shell courses and heads. The requires development of high deposition welding techniques like Electro Slag Welding (ESW) or Submerged Arc Welding(SAW) using strip electrode. Welding is carried out by using strips of up to 120mm wide and 0.5mm thick, which results in deposition of 42 Kg/arc-hr. ESW overlay of stainless steel and nickel alloys are regularly carried out by Indian fabricators. Weld Overlay of Nozzle Pipe/ Fittings by Mechanized Processes: all nozzle attachments in a clad/ overlayed reactor call for weld overlay on the inside surface as well as on the faces. Special welding torches to carry out weld overlay by mechanized FCAW, GTAW or Thin-wire SAW (1.2mm/1.6mm dia) inside nozzle pipes, forgings, and 900 elbows. Weld overlay has been carried out successfully on nozzles with a very small bore (as low as 25mm) and extra length (as high as 400mm) wear resistant overlay operations have also been carried out on OD of bars by Plasma Transferred Arc Welding(PTAW) Process. Each weld joint of a vessel calls for stringent inspection and testing requirements as per the requirement of manufacturing code, customer specifications, and other applicable standards. The test generally includes Non-Destructive Testing (NDT) like Radiography (RT) Ultrasonic Test (UT), Magnetic Particle Test (MPT), & Penetrant Test (PT) in addition to the thorough visual examination. Out of these tests, RT & UT are given maximum importance. Due to the higher wall thickness of the vessels, RT is being preferably done using a high power Linear Accelerator (LINAC). On the other hand, Micro focal anode X-ray is being used for detection of a flaw in Tube to Tubesheet joints for critical nuclear applications.The concept in NDT has shifted from 'only flaw detection' to 'flaw detection, characterization and flaw sizing'. There is a huge advancement in UT technology over the last few years. His resolution UT including Time of Flight Diffraction (TOFD) has become a mandatory requirement for all critical reactor weld joints. Stringent requirements of nuclear and aerospace projects have taken capabilities in carrying out various NDT to its zenith. Significant changes have taken place over the years in welding and allied areas in heavy industries in India. From making simple equipment with basics materials to fabricating the most complex ones involving stringent quality requirement, the Indian heavy engineering industry has envolved a lot. The industry has become mature and can compete globally for various orders, due to its demonstration capabilities in welding and allied fields. WQC Institute of NDT and Inspection Technology is established for the advancement of Science & Technology, application of NDT and to impart specialized skills to professionals engaged in NDT and Quality Control. WHAT DOES A PIPING DESIGNER NEED TO KNOW?